Preparation time: 15 minutes. Baking time: 1 hour. Chilling time: 8 hours. Standing time: 15 minutes. Coat a 9″ x 13″ baking dish with cooking spray. Layer 10 slices of bread in the bottom of the baking dish (you may need to cut some slices to fit). Top evenly with cream cheese slices, then remaining bread slices. In a large bowl, whisk together egg substitute, milk, vanilla extract, syrup, and cinnamon. Pour over bread, coating all the bread. Cover with plastic wrap and refrigerate overnight, or 8 hours. Remove from the refrigerator and let stand at room temperature 15 minutes while oven preheats to 350ºF. 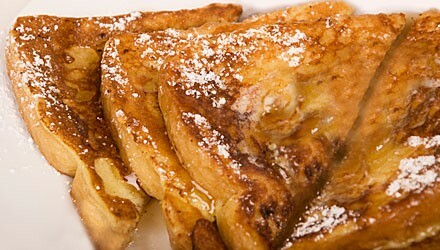 Bake 1 hour, or until all liquid is absorbed and the French toast is set in the center. When the top begins to brown slightly, lay a sheet of aluminum foil over the baking dish. Cut into 12 pieces and serve with Rise-n-shine raspberry syrup. Serving size: 1 slice (approximately 3 inches x 3.25 inches). Exchanges per serving: 1 1/2 starch, 1 lean meat. Carbohydrate choices: 2. This recipe was developed by Tami Ross, a Diabetes Nutrition Specialist and Certified Diabetes Educator in Lexington, Kentucky. Disclaimer Statements: Statements and opinions expressed on this Web site are those of the authors and not necessarily those of the publishers or advertisers. The information provided on this Web site should not be construed as medical instruction. Consult appropriate health-care professionals before taking action based on this information.